MySQL, despite its ease of use and popularity has a dark side of instability and crashes. Communities have forked MySQL, now an Oracle subsidiary (that was once a Sun subsidiary…), spawning alternatives like Percona, Drizzle, and MariaDB to improve quality and keep MySQL a viable database server. Newer servers (platform version 4.5+) use alternatives like Percona and MariaDB. Stability is much improved over MySQL, but crashes may still occur. 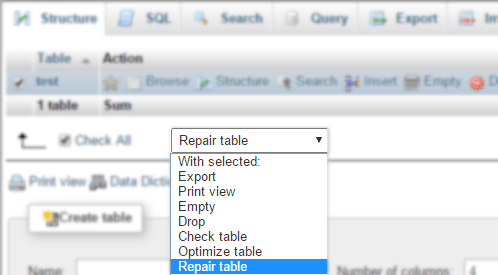 Tables may be repaired using phpMyAdmin within the control panel under Databases > phpMyAdmin. Operation will complete shortly. Do not close browser until confirmation. Make sure you have sufficient storage available in your account otherwise the operation will not complete. This entry was posted in MySQL and tagged crash, mysql.